I had originally intended to write about Catherine Hunter’s mystery book set in Wolseley as the second post in my series on Winnipeg neighbourhoods through crime fiction. What neighbourhood revels more in its stereotypes and is riper for parody than Granola Heights, after all. Hunter certainly has some fun in The Dead of Midnight (2001), as members of a Wolseley book club are bumped off one by one, by means outlined in the series of mystery books the club has been reading. But then I got a summer cold and spent a weekend on the couch, reading two other crime novels by Hunter. And I realized that although St. Boniface figures in both Where Shadows Burn (1999) and The First Early Days of My Death (2002), these three novels taken together do not fit into my neat little neighbourhood frame, nor are they very similar to each other. It’s as if they were written by three different writers. 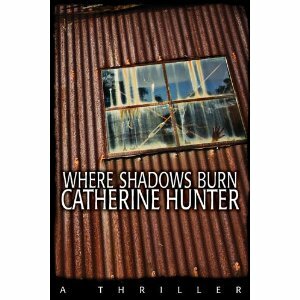 When you realize that she is best known as a poet, you begin to see that Hunter is using crime fiction to explore themes that are also threaded through her poetry. Where Shadows Burn, was her first kick at crime fiction, and it is paranoia-inducing. By the climactic scene at the end of the book, the reader doesn’t trust any of the characters, including the lead character. That’s quite a trick. There is a ripping, hammer and tongs finish. Along the way Hunter uses the Orpheus and Eurydice myth to give a deeper resonance to themes of grief, loss, and regret. The story unfolds while a production of Hamlet is in its design and rehearsal stages, and this, besides giving theatre fans an interesting look backstage, adds the theme of inexorable revenge to the soup. The image of a person floating above the world occurs both in the poetry and in the novels. In The First Early Days of My Death, a character floats above Winnipeg, descending to haunt the people she thinks have murdered her and desperately trying to alert her loved ones as to the identity of the guilty party. There is a dreamy, surreal quality to the writing, much like those paintings of Chagall, where two lovers, totally taken up with each other, float lazily above villages and farms. Winnipeg, in this book, appears as, “the exact, geographical centre of coincidence,” where the Assiniboine and Red rivers, having an entire continent in which to avoid running into each other, nevertheless do collide, making Winnipeg a place where other unlikely events can happen, too. I haven’t yet read Hunter’s fourth, and so far last, crime novel, Queen of Diamonds (2006), but since its main character is a medium, Hunter once again seems to be testing that, perhaps, porous barrier between the living and the dead. Catherine Hunter teaches English at the University of Winnipeg and has published four poetry collections. Of these, Latent Heat won the Manitoba Book of the Year award in 1999. She has also recorded Rush Hour, a spoken word cd.